It was right down the street from our hotel. I ordered the California omelet with jack cheese and avocado. The buttermilk biscuit that came with it was horrible! It was rubbery, tasted like day old Bisquik and was obviously microwaved. My omelet was pretty good. 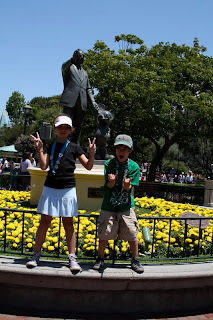 The kids were, of course, super excited to get to Disneyland, not just to ride the rides, but to do some Disney pin trading and Vinylmation trading. Our friend Jacquie from Lewisburg turned us on to the pin trading. People have lanyards with Disney character pins on them. You can trade them with a cast member wearing a similar lanyard. You can trade up to two pins with the cast member. They have to give you whatever two pins you want and accept whatever two pins you offer in exchange. You can also trade with other non-Disney cast member pin collectors, but they don’t have to trade with you and will only do it if you have something they desperately want. 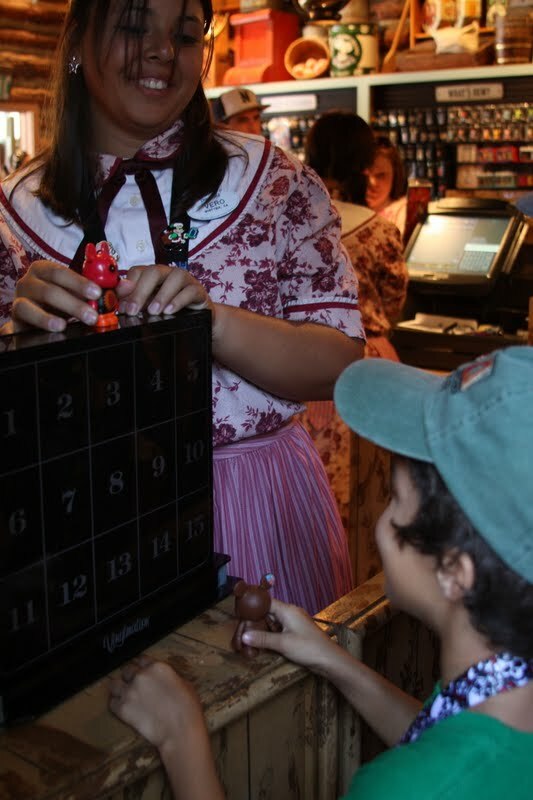 Jacquie and her family are really into the pin trading and collecting certain sets. They order a huge bag of random Disney pins off of eBay, keep the ones they like and bring the rest with them to Disneyland to trade with cast members. Before we left on our trip, Jacquie gave us some spare pins so that each of the kids started out with 20 pins. Poor Aidan left his at the Brian Head cabin and Emma managed to lose half of hers between Lewisburg and Disneyland (don’t ask me how). Ian had all his pins (he’s pretty responsible). They were also able to trade Vinylmation figures, which are Mickey Mouse shaped, but with different characters or designs printed on them. It was pretty exciting for them to trade both items. April and John stayed at the same hotel and took us to Disneyland. Collin and I were freaking out when we went into the parking garage because of our Thule space case. I was so scared that it was going to scrape the garage ceiling or get knocked off completely! 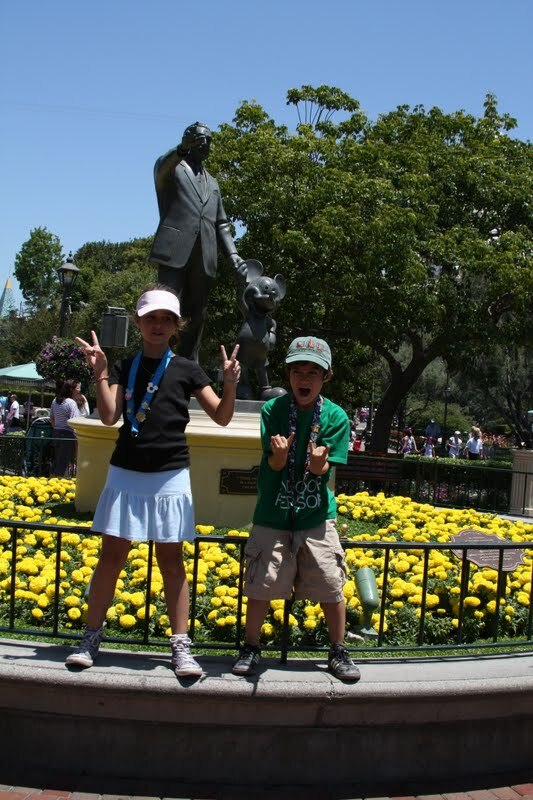 Disneyland make $4 million a day on ticket sales alone which explains why our tickets were so darned expensive at $80 a pop. 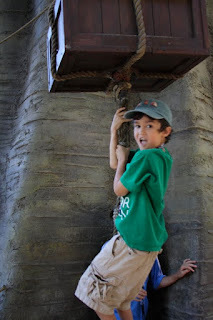 We took a pretty laid back approach to Disneyland. We tried to get fast passes for rides we really liked, sometimes we were successful, other times our fast pass said we could ride Star Tours at 11:30 p.m. (by then we would have been in Fountain Valley). So we rode Thunder Mountain Railroad, Space Mountain, Pirates of the Caribbean, the Haunted Mansion, and Buzz Lightyear’s Star Command. We also ate lot of JUNK food, traded a lot of pins and some Vinylmation figures, and watch Bill Hill and the Hillbillies. Bill Hill and the Hillbillies was such a fun show. The musicians in the band were truly talented and acted very hokey and silly. The kids thought it was hilarious and so did we. It was also nice to sit in an airconditioned place out of the sun while eating ice cream. Food-wise, we did things a la carte and didn’t bother eating at a restaurant. We had some kabobs, fresh fruit, cookies, churros, and ice cream. I felt a little sick after all the junk food and rides combined. We called it a day around 5 pm, said goodbye for now to Collin’s parents and fought traffic all the way to Fountain Valley. We showed up a titch too early. Mal, Melissa and their kids were still at their daughter’s birthday party. Oops! But not five minutes after pulling up to their house, Mal showed up with some of his kids. Their house is awesome! They are remodeling the yard and did some of the downstairs. It looks like a cross between Pottery Barn, Restoration Hardware and Mormon Chic. (I’m totally jealous.) Um, did I mention that the beach is literally 5 minutes away and that Mal goes surfing whenever he wants to? Our kids were really excited about their playroom, which is gigantic and loaded with toys. One thing thing Mal and Melissa’s kids don’t have is any kind of video games which makes at least one of them totally obsessed with video games on people’s phones. Collin made a friend by hiding his phone and giving their son clues to where it was. After we put the kids to bed without dinner (they didn’t say anything, so neither did we), we stayed up pretty late talking about old times. Mal and Melissa are friends of our from our college days, specifically when we all got engaged. Between our three apartments in the same complex, we had 5 different couples get engaged in the same year. BY-Woo, no joke.